I have a question I'm hoping to get some input on. I bought the Eureka Solitaire, one person, three season tent. Unfortunately it's not free standing... Will I be able to get my tent standing at trail camp? There are some concerns from people that I have talken to and they feel it is all rock and no soil up there. Has anyone set up a stake tent up there?? There's not much soil up there. Probably a few sites with, but many without. Take the stakes. All you need to do is find a 20 pound rock and lay it down on top of the string, with the stake lying behind the rock. Or tie the guy lines to the rocks with a loop around a big one. I found a recent thread where the same question was asked. Here's a trail camp picture. 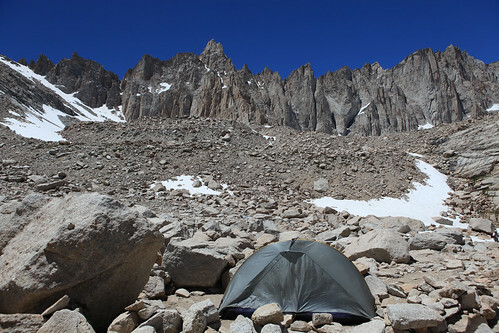 Most of our BP trips in Yose include an overnight in a very open, bald granite site. I do not think that we have actually used an in-the-ground stake at any time. Most of the guys do not have free standing set-ups, so they do exactly what Steve says: they collect several rocks in the 15-20lb range and tie the lines around them; it has worked well even in storms. I think I got one or two out of 6 stakes at Trail Camp but Steve is right with rocks, you just have to take the time and get it fine tuned. Trail Camp is actually a nice place to just lay out since there normally isn't any bugs. That spot in the image is further down then the other posted above and lets you get off the trail a bit and away from most people so it's not so noisy. Reminds me... Bob R recommends some places quite a ways off the trail, I think on the north side. I think they are completely out of sight of the trail. People always complain about early hikers tramping through in the wee morning hours -- people trying to make the summit by dawn -- and talking loudly all the way through Trail Camp. So remember this when looking for a spot. Generated in 0.066 seconds in which 0.006 seconds were spent on a total of 14 queries. Zlib compression disabled.